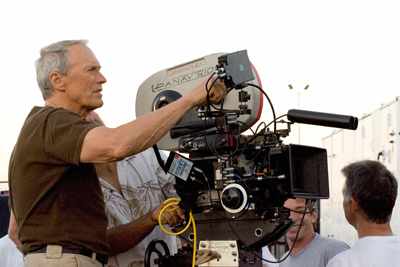 Clint, if you’re offended by being associated with my screenplay, stop by so I can apologize over dinner. Nothing fancy–but nothing with a drive-through, either. Mature man with greying hair enters from stage left, running. Reaches mid stage. Looks at audience with expression of bewilderment, as though he’s forgotten what he was going to do. Scratches head and exits, stage right. Mature man returns from stage right with a long sheet of paper anchored to a clipboard—turns to audience. MM: I’m trying to juggle all of the realities of life, but as fast as I cross things off my list, other things are added. Mature man turns and exits stage left, frantically writing on list. Mature man enters stage right, still writing on list. Stops center stage and looks at audience with puzzled expression, knowing he just exited stage left; continues to walk and exits left. Mature man enters stage left with list, and at center stage turns to audience. MM: I think that maybe, just maybe I’m finally making progress! Identical mature man (Identical) enters stage right, passes behind mature man, and exits stage left without being noticed by mature man. Mature man remains center stage with list. Identicals enter both right and left and pass behind mature man. Mature man turns to right, too late to see one identical, then with comic rapidity turns left, with same result; mature man turns to audience looking concerned and slightly upset. MM: When I was younger, I could do this. Now, not so much! Two identicals (four total) pass from each side behind the man. Mature man turns and tries to see what’s happening, but misses. As he is looking behind him, two more identicals pass left to right and right to left in front of him. Mature man becomes increasingly frustrated, although he does not seem to know why. All identicals enter stage, and mature man spins about at first missing each (looking left when right approaches, etc.) but then spins about rapidly, accounting for them all. MM: What the bloody hell is going on? Identicals (speaking together): Don’t ask us. You’re the one in charge. Oh, wait. That’s not a movie. That’s been my life lately. And, how has your life been? This entry was posted in Actor, Arts, Communications, Culture, Humor, Media, People, Philosophy and tagged imagination, movie, screenplay, script. Bookmark the permalink.